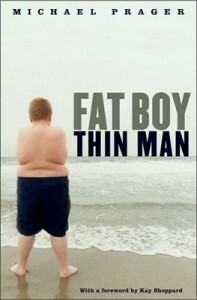 Michael Prager is the author of Fat Boy, Thin Man, a memoir chronicling his journey with food addiction. Michael was kind enough to sit down me to discuss his book and strategies that might apply to you, Choose Health readers! Elizabeth: Hello, Michael. Thanks so much for taking the time to chat today. Michael Prager: Hi, Elizabeth. Thanks very much for your interest. Elizabeth: Fat Boy, Thin Man details your journey as a food addict toward wellness. It seems to me that many people have an “ah ha” moment that catalyzes their journey — did you have such a moment? Michael: I was very slow in this respect. I never thought I was a food addict, or even that food addiction existed. Then I wasn’t at all interested in any of the remedies/attitudes/practices that existed to fight my addiction. Then I adopted one, and then another one, and then others, over a long period of time. The process showed me that I may be “wicked smaht,” as we like to say in Boston, but I was a very slow learner when it came to my biggest health issue. So I would say my “ah ha” was far more of the slow, cumulative, educational variety, rather than a bolt of lightning. Elizabeth: You have some pretty rigid strategies for your eating, Michael. How did they develop and how do they work? Michael: Ah, Elizabeth. I take the thrust of your question and will answer it, but first I would quarrel with your use of the word “rigid.” Perhaps it’s window dressing, but I much prefer “rigorous” — I actually have a great deal of variety in my diet, and options should my first plan goes awry. The difference, to me, between the two words is that yours suggests confinement, and mine suggests the importance of choosing the best option in any circumstance. Now, to your question: I got my first real, sustainable food plan when I was in rehab in 1991. I stuck/tried to stick with that plan for a long time, well past the time when I should have, owing to changing conditions. Then, on strong guidance from loving friends and counselors, I engaged a nutritionist (Theresa Wright of Renaissance Nutrition in East Norriton, PA) who has been guiding what I eat for 11 years. In that time, I’ve gone from eating 4 times a day to 6, with proportions that have changed multiple times, all in response to lifestyle changes (when I moved to second shift, for example, or when I became a consistent jogger). My food plan rules out certain substances, most prominently refined sugar and refined grain (flour), but also dried fruit, peanuts, and popcorn. I don’t say that these substances are bad; especially not the latter three. I don’t eat them because I have never demonstrated that I can eat them without craving them. Many other people can and do eat them freely; many others can eat one or more of those, but also have their own “uncomfortable” foods that they avoid. I was guided to this principle, that some foods were never going to be neutral for me, and with that notion in mind, I was able to start noticing which foods those might be for me. I strongly suggest that refined sugar and refined grain are “uncomfortable” foods for the widest numbers of people, but they are so ubiquitous that practically everyone scoffs at the idea that eliminating them might be a healthy action. I was not only skeptical but militantly opposed, especially regarding flour, but once my out-of-control eating I made me desperate enough to test the idea that possibly/maybe/perhaps I could be suffering from ingesting it, I got to see what life would be like if I eliminated it from my diet. That was more than 10 years ago, and I still have no desire to take it up again. Yes, I like flour, especially breaded, fried stuff, but comparing that enjoyment with the downside, I happily choose not to eat it, just as someone who likes the taste of strawberries will happily go without, if it will mean avoiding those nasty hives that eating strawberries brings out in them. It’s really very similar. Elizabeth: In the book, you mention how your food strategies won’t necessarily work for everyone. What I’m wondering, though, what are universals from your journey that Choose Health blog readers can apply to their lives in a positive way? 1) Diets as most people think of them can’t work, not when they are temporary changes to address long-term problems. 2) Having a food plan and committing to it as one would commit to a needed medical treatment is more important than what the food plan says. Yes, a plan that allows, say, only unlimited pizza and ice cream IS a plan and won’t likely result in weight loss or health, so there are limits. But sticking to a clear, defined path — where there’s no such thing as cheating — is going to help any reasonable food plan to succeed. Can you imagine saying, “I cheated on my chemotherapy schedule today. I just didn’t feel like doing it today”? People may make that choice, but who would respect it? 3) Another non-food strategy that works for almost everyone, almost all the time, is support. In this context, that means asking for help, or offering your help in exchange for someone else’s. Many dieters can stick with their plan most of the time but stumble when something particularly annoying/hurtful/boring/whatever comes along. If you have a plan for getting through those few tough moments, you could put together quite a consistency. The longer I stay on my plan, the longer I’m likely to stay on my plan. This is true not only as a matter of momentum, but also biochemically: Some food provoke cravings, and avoiding them completely helps to avoid them; deciding to have “just a little” can be the worst misstep, even if that seems unfair. Biochemistry and fairness have very little overlap. 4) If you have to choose between what you’ll eat, or how much you’re going to eat, emphasize the latter. Even if you are eating well-prepared food from high-quality ingredients, eating too much of it will worsen your health. That’s a false choice, of course, but does help identify which way to lean when priorities clash. 5) Nutrition really matters, and yet, in my observation, most people think junk food is rewarding fun and nutrition is for sissies. Not very many people go out to celebrate with, say grilled veggies, and when the bosses want to say thanks for a staff’s extra efforts, they rarely splurge on salad for everyone, right? Elizabeth: If you could offer readers struggling with their own weight loss and wellness journeys some advice, what would you tell them? Michael: If I symbolize anything, it is that vast change is possible. I would never have said that before I embarked on this path, and I continued to scoff at the idea well into my recovery. But after 20 years, I accept it without the slightest hesitation. I cannot prescribe which steps will be enough for any individual, but the universal principle I have observed is that if “X” isn’t enough, then I just have to try “X+1.” Knowing that change is possible — and I assure you I am neither savant nor guru, so if it came to me it can come to you — simply means we only need to find the minimal package that will work for us, regardless of how big that package turns out to be. Elizabeth: Thanks, Michael! For more information, please take a look at Fat Boy, Thin Man online as well as Michael’s blog, which focuses on sustainability! Still want more? Check out Michael’s great interview on The Steve Katsos show!